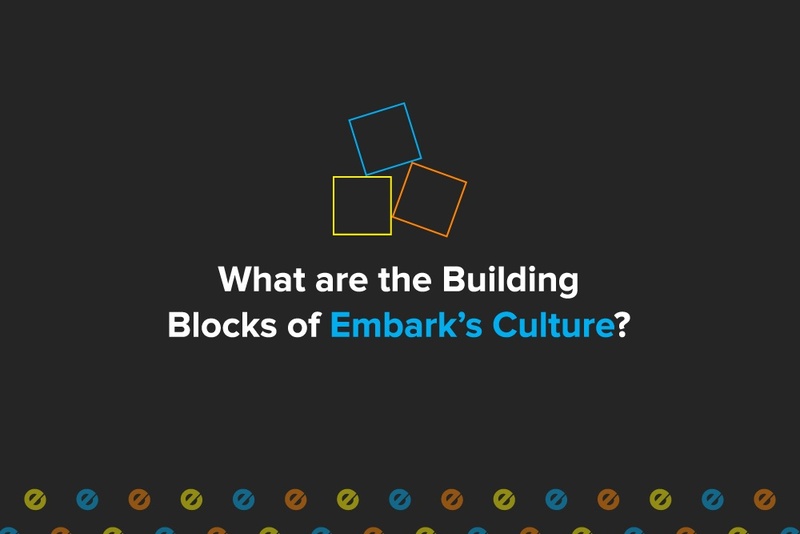 What are the Building Blocks of Embark’s Culture? At Embark, we don’t mind being an outlier on the financial advisory industry’s bell curve. In fact, we prefer to be a standard deviation or two away from the mean, especially with our unique culture, spirit, and perspective. We happen to think the financial advisory world could use a few more Embarks – proudly being a square peg in an industry of round holes – but, then again, we might be a bit biased. Embark’s culture is what separates it from the industry, absorbing the best traits we see in firms around us while rejecting most of the stereotypical, static, and homogeneous cultural traits that accounting can unfortunately be synonymous with. This a la carte approach allows us to marry the unique qualities and gifts of our team with the very best aspects of accounting culture, creating a truly special organization that sticks out like a sore thumb – in the best of ways – from the industry. As much as we value our relationships with our public accounting colleagues, we can’t help but feel a sense of relief from our perch on the outside looking in. Between their immense turnover rates, minimal training, long and arduous hours, and the inevitable incongruencies between work and personal lives, we can’t say we’re surprised when we find talented, motivated people looking to see what’s beyond the vast public accounting wall. Of course, as you might have known already, the accounting grass isn't always greener on the other side. When people look for something other than the often confining world of public accounting, they run into the open arms of industry accounting to only find the experience more than a bit sobering. As many are dismayed to discover, the repetitive nature of industry positions can make even the most enthusiastic and open-minded feel robotic at times, a production worker on a financial assembly line that can lack fresh challenges and room to stretch accounting muscles. Millennials are particularly susceptible to this sense of repetition, finding it difficult to find a position that is challenging enough to constantly pique their interest but still leave time to maintain a fulfilling life outside of the office. The investment banking industry, for instance, has traditionally had a blinding gleam to it as ambitious undergraduates saw their futures paved in gold bullion and stock options despite not seeing the sun for weeks at a time. Millennials, however, don't seem to share that same I-Banking fascination and crave balance between stimulating work, pay, and an outside life. That said, those content being on that accounting assembly line for years at a time might not necessarily be a good fit at Embark. While one isn't better than the other and there's certainly room for a wide range of company cultures, the team at Embark tends to attract people that thrive in multiple roles and prefer establishing and maintaining client relationships through their interpersonal skills. Although we are not exactly charting new territory here, many of the common gripes about public accounting bear repeating. Working 60 hours in a light week, 90 in the busy season, might be tolerable for stretches but, over time, can start to erode even the most stalwart of souls, particularly in light of the modest corresponding salaries. Obviously, there's a disparity between the amount of work and remuneration that can leave something to be desired. Likewise, when you seem to be working such overbearing hours, it can be difficult to achieve a healthy balance between your work and personal life. At Embark, however, we don't feel the need to artificially construct "you" time so that TV shows can be binged and large buckets of balls hit on the range. In fact, Embark detests that mentality and fosters a healthy and content environment in a completely different way. At Embark, we want people who never grow tired of solving complex accounting and finance problems, that feel personal contentment by immersing themselves in their work rather than seeing their job as a means to an end. The team at Embark – to an individual – feel like we're finding a healthy balance between work and personal lives by simply enjoying the environment, the work, other team members, and conducting our business without the rigidity found in nearly every other industry firm. When firm leaders at Embark look you in the eye and think a day at home might do you some good, they'll tell you to find your car keys and go home for the day, never holding it against you. In other words, Embark always puts its people first, creating an environment where team members are happy and more appreciative of their job which, inevitably, improves the quality of work and benefit provided to the clients. Never afraid to put our money where our mouth is, Embark doesn't do any fixed-fee work, only time and expense engagements. If there is a project that requires 80 hours per week, we’ll gladly put two team members on it rather than inundating a single person who will likely do far lower quality work. Similarly, while the industry is infamous for last minute travel that is inevitably sprung on an employee at the very worst time, Embark relies on a much more efficient and intelligent approach to travel. While a few days here and there are always necessary to build client relationships, there's simply no reason to travel for the duration of an engagement, especially when there isn't much face-to-face time with the client. Instead, Embark leverages technology to find better solutions – including Skype, email, cloud, and others – that keeps the client happy with lower travel costs and employees off the lonely road. The leadership at Embark didn't just wake up one morning with a head full of ideas concerning our ideal corporate culture. Instead, our approach is built from a deliberate and meticulous process that included tens of thousands of interviews with public and industry accountants in the Dallas-Fort Worth area. The results, as you might imagine, are something we take endless pride in. Embark might not be for everyone but, for those that are a good fit, you'll never enjoy your work more.